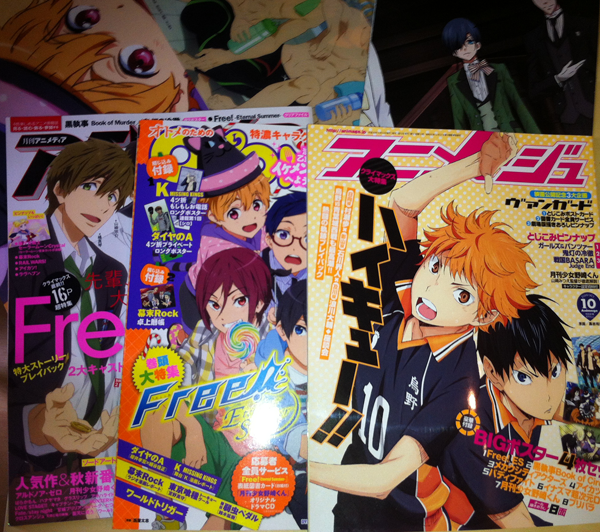 I picked up a few anime magazines this month, so it's time for the last (?) regular monthly review of Sengoku Basara Judge End coverage. There will be some extremely mild spoilers until the next headline lower down in this post. 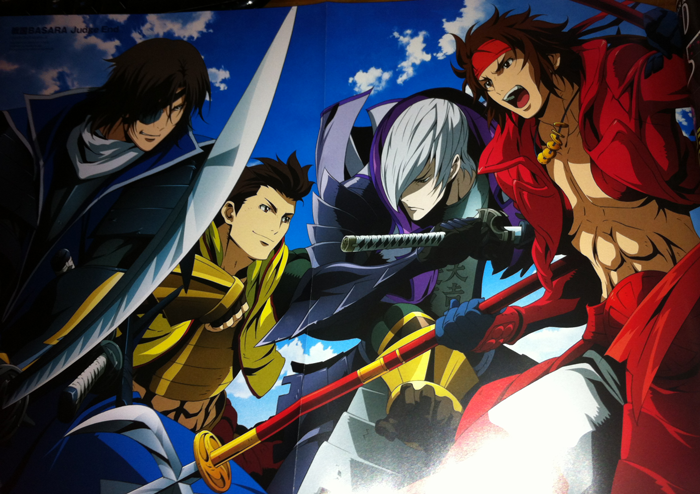 It was Animage which contained the best Sengoku Basara Judge End information for September. Firstly, it confirmed the two last episode titles for Sengoku Basara Judge End. They're so vague that I don't think it's necessary to hide them under a spoiler warning; episode 11 will be called Shinpan ('Judgement') while the final episode will be Shirube ('Guide'). The magazine also contained a pull-out poster with all four main characters (sample picture above), and a short interview with anime director Sano Takashi covering the story up until episode nine. Sano explained that both Masamune and Yukimura lost something extremely precious earlier in the series; for Masamune it was his pride, and for Yukimura it was Oyakata-sama. In realising what they had lost for the first time, they took a step forwards. They've now each experienced some growth, not just in body and mind but also by reaffirming their individual beliefs and purpose. In Sano's opinion, Yukimura has become someone that Mitsunari can believe in during in the lead-up to Sekigahara, while Masamune is someone that Ieyasu could always have admired. Even though it had all been planned out in advance, Sano made a lot of refinements during the storyboarding for the climactic scene in episode eight where both leaders gave their speeches. The staff paid a lot of attention to the way they divided up the cuts to ensure that the scene flowed well. Sano's impression of Tenkai is that he's devoted to his own selfish desires and willing to do appalling things in order to achieve his goals. At the same time, he provides Kobayakawa Hideaki with emotional support and appears to be a kind person when he's around him. The line of dialogue which has left the strongest impression on Sano so far was Masamune's "It's the beginning of the PARTY to seize the country!" from the start of the very first episode. When he heard it during the recording session it made him think that the anime was really getting started. On the climax of the series, although it looks like a free-for-all fight he thinks people will want to see the way that the battle concludes with their own eyes. As for match-ups to look out for during the Battle of Sekigahara, Sano recommends the fight between the pair who started the war: Ieyasu versus Mitsunari. Since the cast and sound director had all been working on Sengoku Basara for a while now, it's no exaggeration to say that the recording sessions went very smoothly right from the first episode. Sano didn't always understand the spontaneous ad-libs that the actors made when they were testing the sound, but since they were able to bring most of the cast members together the recording sessions had a wonderful team-like atmosphere. If Sano had to pick a side to join for the battle, he'd want to be in the Eastern Army - and he'd want Ootomo Sourin to try to pursuade him to join the Xavists! Lastly, the subject of Judge End was briefly revisited in an interview with singer Ishikawa Chiaki in the music pages. Interviewer: The second song on your new CD is Hokkyokusei ~Polaris~, the ending theme for the Sengoku Basara Judge End anime series. The 'North Star' in the title also features in the lyrics, right? Ishikawa: There are samurai who are willing to throw their lives away and fight for the sake of the lord they serve. I thought that this relationship resembled that of the North Star and the stars which revolve around it in the night sky. Even when you're on a battlefield in the middle of the mountains and you've lost sight of where you are, by looking at the North Star you'll find your direction, won't you? With that in mind, I wondered whether they would look up at the North Star on the night of a battle, rather than looking up at the moon. Interviewer: The third song on the CD is called Tír na nÓg. Its sound and lyrics also evoke the image of a battlefield. Ishikawa: Since I didn't incorporate Japanese 'flavour' into the sound of Hokkyokusei ~Polaris~, I thought about trying to express my own Japanese-style world - which sprung from the flow of 'Basara' - in a different song. The series will apparently feature in next month's autumn edition of Prince Animage. Monthly Animedia was a waste of time this time, as was its sister publication Otomedia. The latter did at least mention both Masamune and Motochika in a column about attractive eyepatch-wearing guys. I originally forgot to buy Monthly PASH! so it isn't shown in the first picture. It contained another interview with Sano Takeshi. Although Ieyasu seems like a nice guy who champions his ideals at first, deep down he's very conflicted. The staff paid careful attention to the way that he's always smiling and speaking positively in order to highlight his inner struggle. 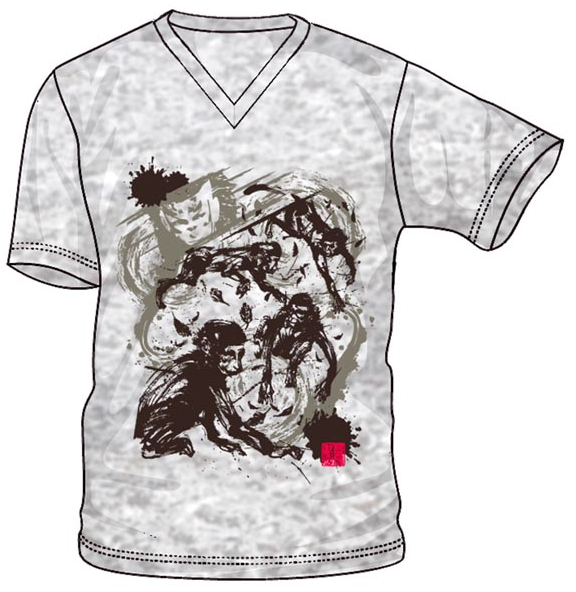 In depicting Masamune falling to rock bottom and then clawing his way back up, they used the story from the original Sengoku Basara 3 game as a framework and tried to expand it a little. With his 'revival' he becomes stronger than he was before. Yukimura's theme in this series is 'becoming independent'. With Oyakata-sama having fallen the hot-blooded guy has nobody to show him the path he should take, and he struggles with worries which stop him in his tracks. It's as though he started out being simple-minded then developed into a true leader. As for things to look out for over the course of the last few episodes, Sano hopes people will keep watching until the very end; both to see what happens in the Battle of Sekigahara, and what happens afterwards. He can't single out any individual character to look out for when all of them have some cool moments. There's Ieyasu and Mitsunari being hit by their true feelings before the conclusion, there's the story behind Tenkai using Sekigahara as part of his scheme, and there's the battle between Masamune and Yukimura. Someone drew a picture of Kanbee for Monthly PASH! 's reader submissions gallery, congratulating him on finally being animated. The editor joked that Kanbee's presence seemed to raise the average age of the characters shown on that page - most of the other submissions were the hot teenagers from series such as Free! and Haikyuu!! so he looked very out of place. 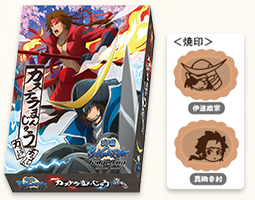 Castella manjuu cakes are to be the newest addition to the Sengoku Basara Judge End merchandise range, according to the official website. They'll be available from anime specialists, tourist shops and the Kyoto International Manga Anime Fair 2014 (Kyomaf) event from 20th September 2014. It costs ¥700 for a pack of eight cakes and the fillings are to be custard (Masamune) and chocolate (Yukimura). 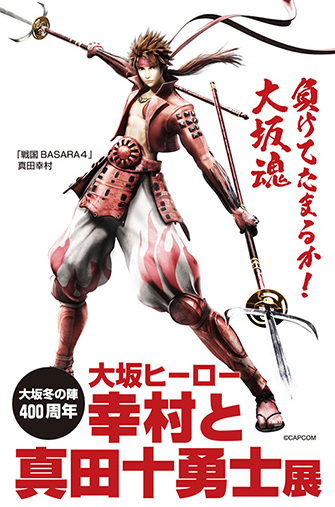 e-Capcom has unveiled the cover artwork for the first volume of the new Mame Sengoku Basara 4 manga, which is due for release later this month. It looks completely different to the clean artwork used for the original Mame Sengoku Basara series, but when it's this cute I don't mind that at all! Having more than one character on the cover means more of them will get to appear in future, too. 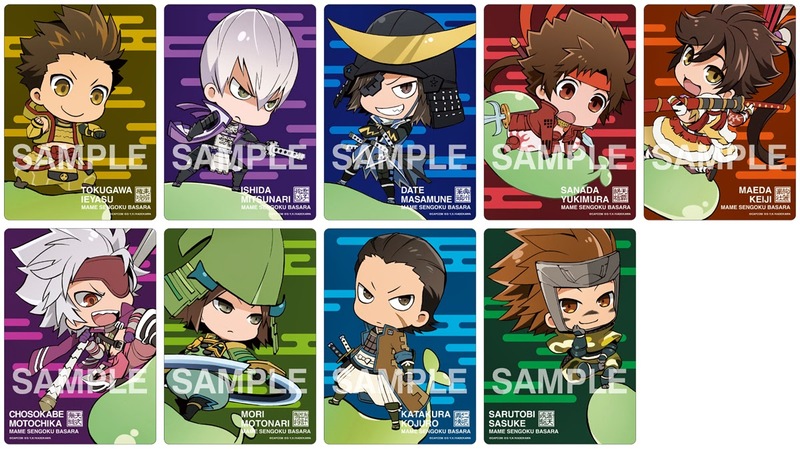 Speaking of Mame Sengoku Basara, the folks at Gift are releasing another round of cute merchandise for fans of the series. The first items are new mouse pads, available in a choice of nine designs for ¥500 each. They'll be on sale from November 2014. There will also be two new sets of clear bookmarks priced at ¥500 apiece. These will be released in December 2014. There will be a special event next month to commemorate the 400 years since the Winter Siege of Osaka, in which the real-life Sanada Yukimura played an important role. 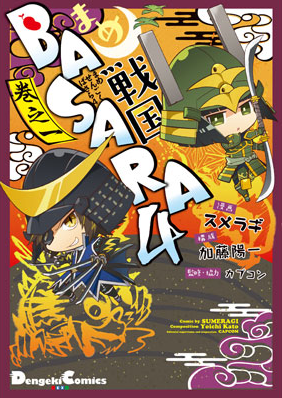 It's only natural, then, that Sengoku Basara 4's version of Sanada Yukimura will be participating in the event by appearing on posters. 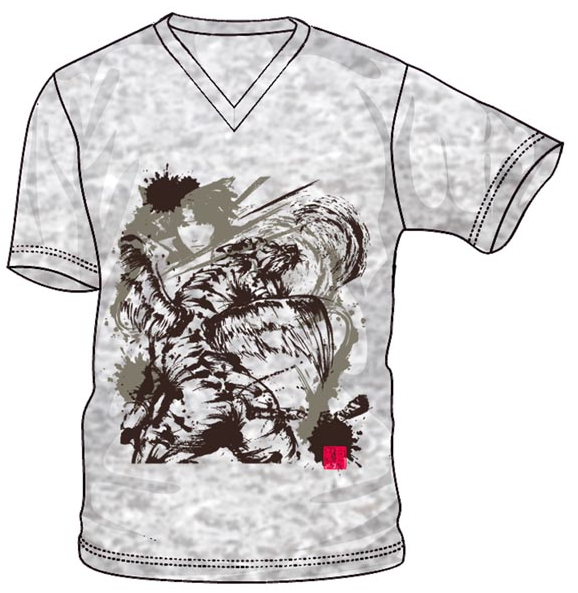 As well as some kind of special campaign for those who purchase their tickets online, there will be illustrations and videos on display for Sengoku Basara 4 and Sengoku Basara Judge End, an exhibition of the costumes used in the Butai Sengoku Basara stage plays and merchandise to buy. The Yukimura and the Sanada Ten Braves Exhibition will take place at the main branch of the Hanshin Department Store in Umeda, Osaka between 8th October and 14th October 2014. General admission will cost ¥500 with discounted pricing available for students. ...while the other has a Sasuke design. Members of the series' official fan club will be sent an invitation for the event with the next issue of the newsletter, which is due for release on 22nd September 2014. It's been announced that a selection of the Butai Sengoku Basara 4 performances will also feature 15-minute 'talk show' events with the actors on stage. The planned schedule is as follows. Last but not least, Animate TV has posted the usual preview gallery for tomorrow's new anime episode. As well as the usual weekly dose of Judge End, tomorrow promises some additional entertainment as the Masamune-kun and Yukimura-kun mascots are going to be unveiled at Inazuma Rock Fes as promised last week. I'm looking forward to seeing how weird they look!